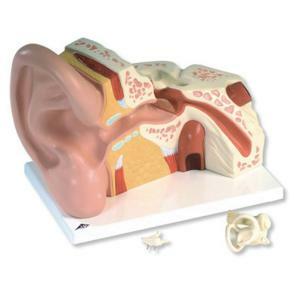 This ear is five times life size for easy viewing from anywhere in the classroom. The Giant ear model represents the outer, middle, and inner ear. Auditory ossicles and labyrinth with cochlea and vestibulocochlear nerve are removable from ear for more detailed anatomy study. The ear model delivered on a base for easy display.